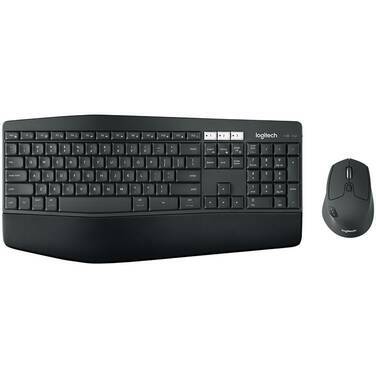 *Computer, wireless mouse and wireless keyboard sold separately. 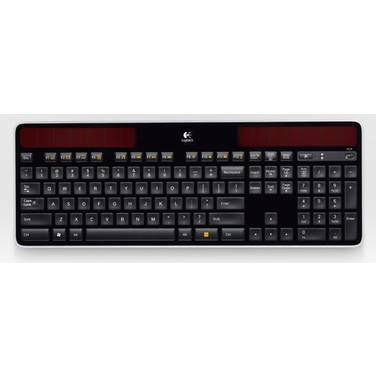 Picture-by-Picture lets you display input from two PCs simultaneously for collaboration with colleagues or clients. 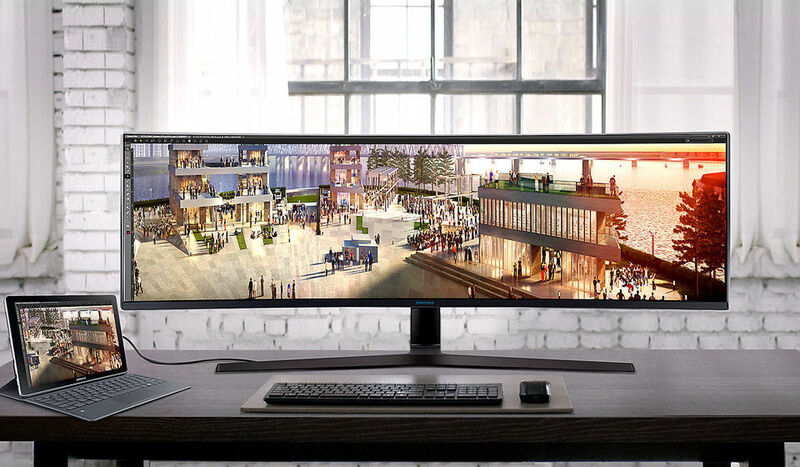 Simply connect a second device such as a compatible laptop to view its display side by side with your primary PC’s display. 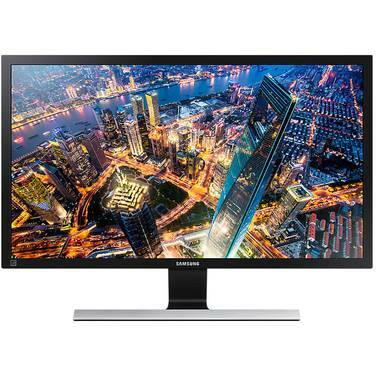 *Compatible computer, compatible Samsung smartphone and Samsung DeX Station required, sold separately. UI of the actual product may be different. *HDMI and charging cable required, sold separately. 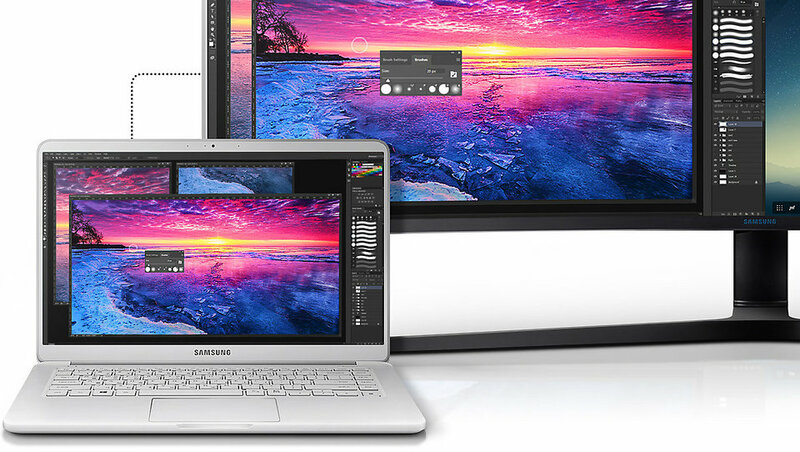 DeX Station supports Galaxy S8/S8+ and above and Galaxy Note8. 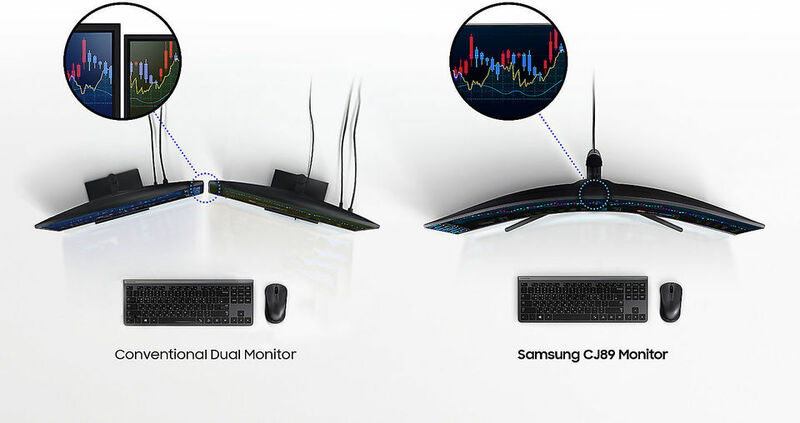 When two compatible devices are connected to the CJ89, its built-in KVM switch lets you control them both using just one keyboard and mouse. 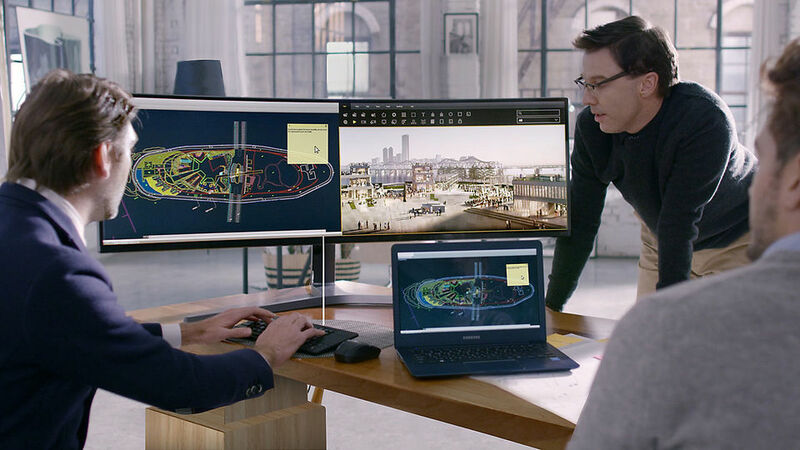 Designed for multitasking and to save desk space at the same time. *Microsoft Office requires users to purchase licenses. Microsoft Word, Microsoft PowerPoint, Microsoft Excel and other Microsoft software require a download to use. 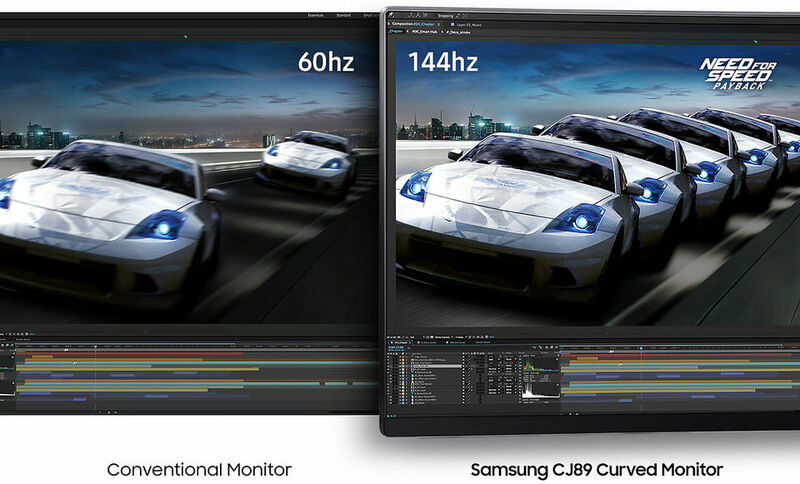 *Compared to Samsung 60Hz Monitors. 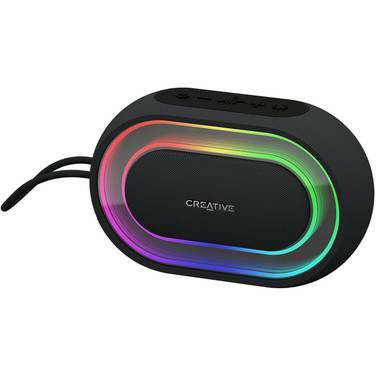 The CJ89 features a wide range of ports, including the newest USB Type-C standard, for compatibility with USB-C connected devices. 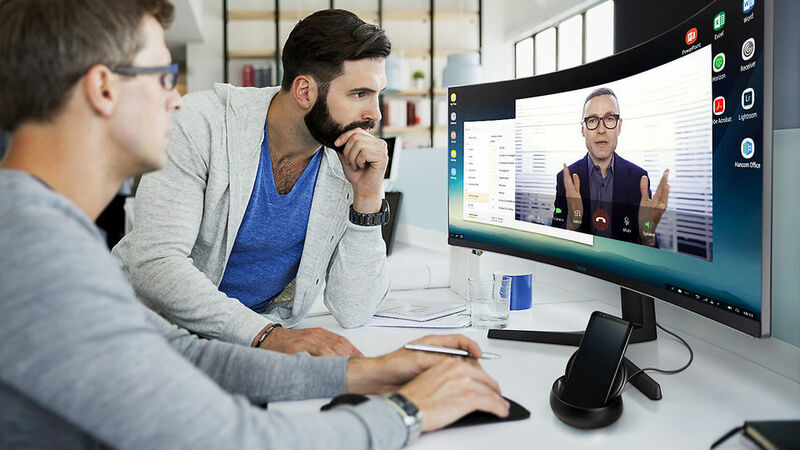 And with Samsung’s DeX Station*, you can even connect your compatible smartphone for a fully streamlined workflow. *DeX Station sold separately. HDMI & Charging cable required, sold separately. 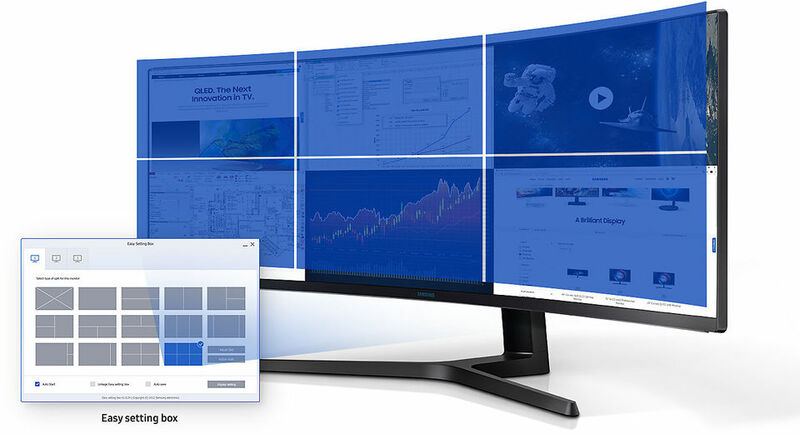 DeX Station supports Galaxy S8/S8+ and above and Galaxy Note8. 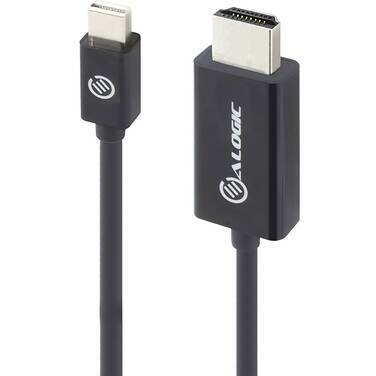 USB Type-C transmits data, video and audio, and power all over a single cable. 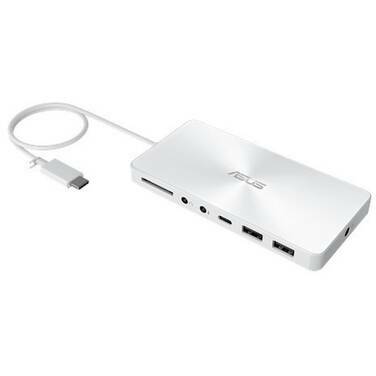 Connect a USB Type-C compatible smartphone, tablet, or laptop to one of the monitor's two USB Type-C ports to display content onscreen and charge the device at the same time. 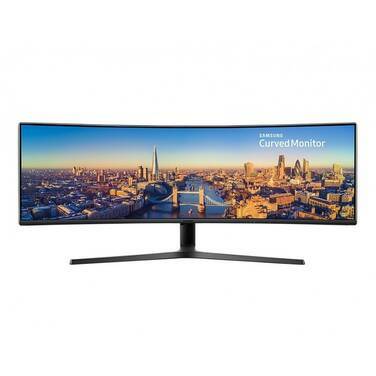 *Compatible computer, compatible Samsung smartphone and Samsung DeX Station required, sold separately. UI of the actual product may be different. HDMI & Charging cable required, sold separately. 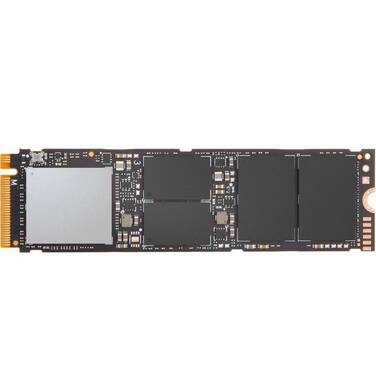 Compatible with Samsung Galaxy 8 and higher models. Keyboard sold separately. 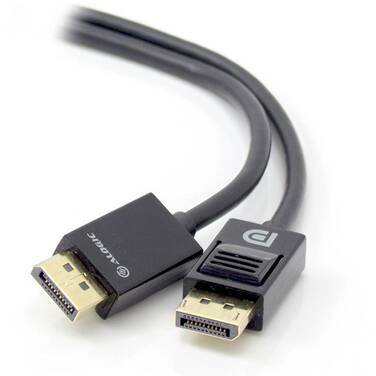 Featuring DP, HDMI, USB and two USB Type-C inputs, the CJ89 lets you connect a range of devices. 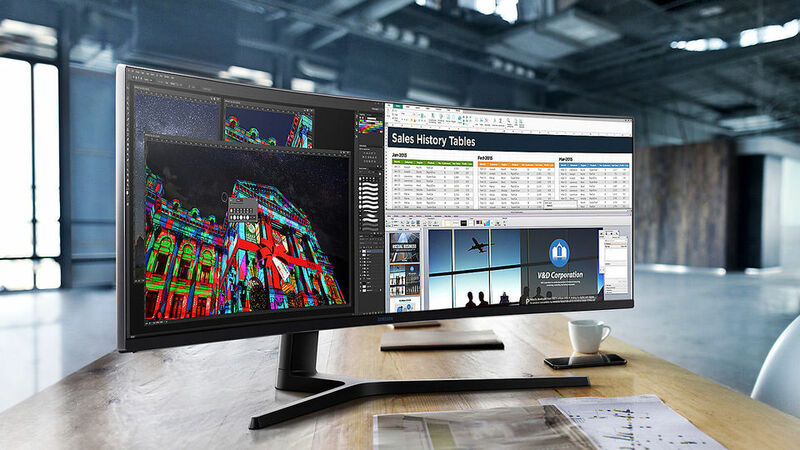 And with built-in 7-watt stereo speakers, you can be sure that whatever you, your colleagues, or your clients bring to the table, your monitor is up to the task. With technologies designed to help reduce eye fatigue and a fully-featured stand designed to provide superb viewing, the CJ89 lets you work in comfort in the workplace. ^“Comparison of flat and curved monitors: Eyestrain caused by intensive visual search task”, 2016. 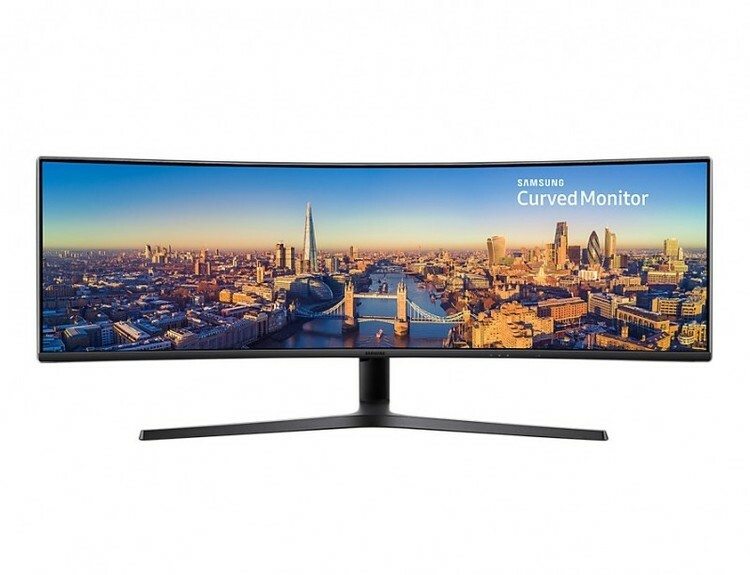 Based on eye-strain questionnaire involving the use of a 34” curved Samsung monitor and equivalent 34” Samsung flat monitor. Study sponsored by Samsung. 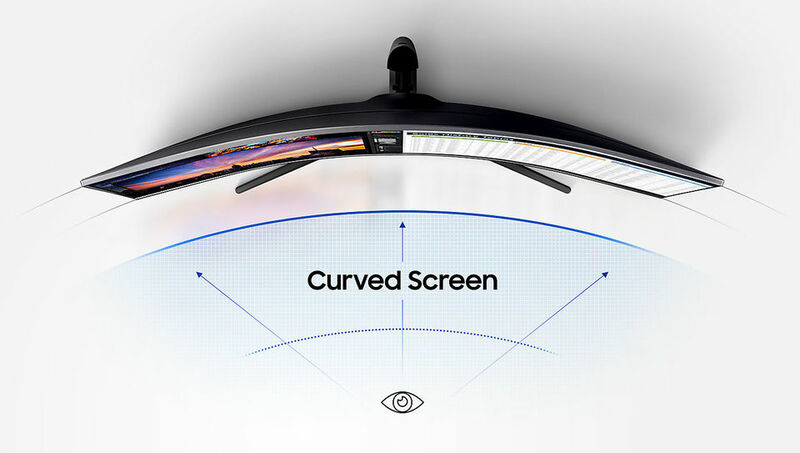 Samsung’s Eye Saver Mode is designed to help reduce fatigue by reducing blue light emissions and its Flicker Free technology suppresses screen flicker. 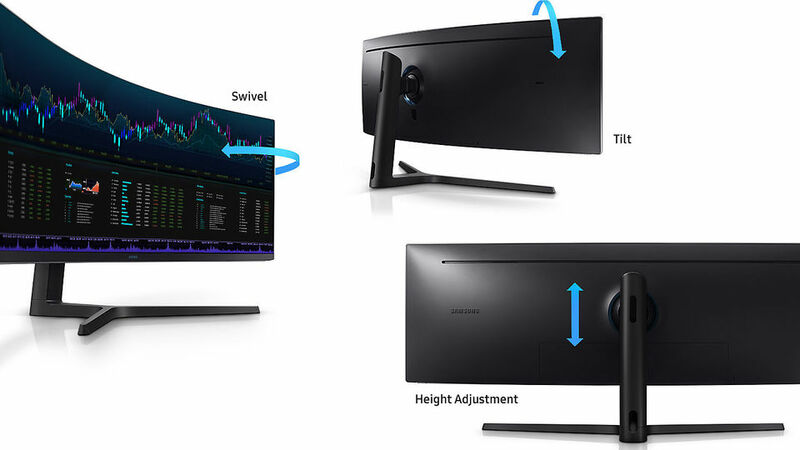 The swivel/tilt and height-adjustable stand offers all the flexibility you need to position the screen for your comfort. The panel’s VESA Standard mount also offers the option of mounting on VESA-compatible arms.